*All Warranties are provided by the manufacturer! Please contact the manufacturer for service! Your claim must explain the nature of the original defect and include your name, address and telephone number. In the event of a non-warranty repair, you will receive a written estimate prior to any repair work being performed. This warranty gives you specific legal rights and you may have other rights which vary from state to state. As defined by federal law, this is a limited warranty. Gensun warrants to the original purchaser that the furniture is free from defects in material and workmanship. The furniture frame warranty lasts for a period of fifteen (15) years from the date of original purchase. The furniture powder coat finish warranty lasts for a period of three (3) years from the date of original purchase. Please note and understand that hand-applied finishes are unique, therefore fading and wearing of these finishes are not covered in this warranty. The fabrics, cushion- fill materials, stone tabletops, and other furniture accessories and parts warranty lasts for a period of one (1) year from the date of original purchase date. Wicker products are warranted against manufacturer’s defect for (3) years from original purchase date. Gensun will pay the freight/shipping costs of replaced product in North America for one (1) year from the date of original purchase. If the furniture frame fails structurally or if the finish cracks, peels or blisters Gensun will, at its’ option, repair or replace the frame or part in the original style and finish whenever possible. However, if the original style or finish is no longer available Gensun will substitute product of equal value in a similar style and/or finish. shipping, improper handling, unreasonable or abusive use, acts of nature or God, normal wear and tear, fading of the frame finish, fading of vinyl and stone, pitting or chipping, harsh cleaning solutions, sun screen and tanning lotions, freezing, mildew/mold, staining, wind, rain, sun, hail or snow, table top breakage, chair and table glide wear, fabric/wicker stretching and fading, over tightening of hardware, and failure to provide responsible care and maintenance for the product (especially at indoor pool and seaside use). The warranty claim must be made by the original purchaser. The product or pictures must be provided, if requested, to Gensun or its’ authorized representative. Proof of purchase and return goods authorization are necessary. Gensun warrants to the original purchaser that the furniture is free from defects in material and workmanship. The furniture frame, excluding Knock down (KD) seating products, warranty lasts for a period of five (5) years from the date of purchase. The furniture powder coat finish warranty lasts for a period of two (2) years from the date of original purchase. Please note and understand that hand-applied finishes are unique, therefore fading and wearing of these finishes are not covered in this warranty. The fabrics, cushion-fill materials, stone table tops, wicker, and other furniture accessories and parts warranty lasts for a period of one (1) year from the date of original purchase. If the furniture frame fails structurally, excluding Knock Down (KD) seating products or if the finish cracks, peels or blisters Gensun will, at its’ option, repair or replace the frame or part in the original style and finish whenever possible. However, if the original style or finish is no longer available Gensun will substitute product of equal value in a similar style and/or finish. shipping, unreasonable or abusive use, acts of nature or God, normal wear and tear, fading of the frame finish, fading of wicker and stone, pitting or chipping, cleaning, sun screen and tanning lotions, freezing, mildew/mold, staining, wind, rain, sun, hail or snow, table top breakage, chair and table glide wear, fabric stretching and fading, over tightening of hardware, and failure to provide responsible care and maintenance for the product. Gensun is not liable for freight/shipping costs of returned or replaced product. Frames are warranted to be free from defects in materials and workmanship for a period of four (4) years. Damage to frames or welds due to improper assembly or exposure to water and sub-freezing temperatures is not covered under this limited warranty. (Therefore, you should not allow water to accumulate inside frames). On delivery, please inspect your item carefully, noting any issues on the delivery copy. 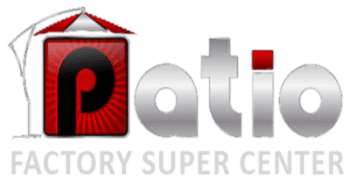 Once you have inspected stock carefully and you have signed acceptance of the item, Patio Factory Supercenter cannot accept responsibility for any defects that may occur as a result of general day to day usage. Any damage on delivery should be reported to the corporate office immediately. Patio Factory Supercenter is not liable for any damage that occurs to or is exposed after goods are signed for and accepted. Please note it is the customer’s responsibility to items check measurements to ensure items will fit in intended areas. We will not be held responsible for items that have not been measured and subsequently do not fit in homes. Upon pickup, once goods have been signed for no responsibility will be taken for any subsequent damage or faults that occur. Please inspect your furniture carefully prior to pick-up and signing of goods. We cannot be held responsible for damage caused while the stock is being loaded into transport or after the furniture leaves our premises. Please note, staff in warehouse cannot be responsible for the loading of items when you pick up. Please ensure you bring someone to help you when picking up your items from the warehouse location. Please also ensure, when picking up your items, that you bring adequate wrapping, blanket or materials to transport your items safely. To get a better indication on lead times you can contact our corporate office, keep in mind these time lines are indicative only and we will not be held liable for any lead times quoted as responsibility will not be taken for unavoidable delays. Please be aware of this when placing your order. Defects covered by warranty will be repaired or replaced at the discretion of without cost to you for parts or direct repair labor. The Manufacturer will cover costs for parts, replacements and direct repair labor at their discretion, however you are responsible for any transport costs. Should you encounter a problem or require additional information, contact the dealer from which the product was purchased or your nearest SFU, LLC retailer. Original proof of purchase must be presented for all warranty claims. A photograph may be necessary.